The economy is at full employment, the stock market is doing fine, and memories of the Great Recession are finally starting to fade. Unfortunately, not everyone is feeling the love of a growing economy, and nowhere is that more apparent than in the housing market. As it turns out, according to the U.S. Census Bureau’s American Community Survey for both 2007 and 2017, lots of states have barely recovered from the housing crash. In fact, the housing market is still below its 2007 figures in several locations around the country. Our visualization provides a useful way to quickly see a snapshot of the housing market before-and-after the Great Recession. 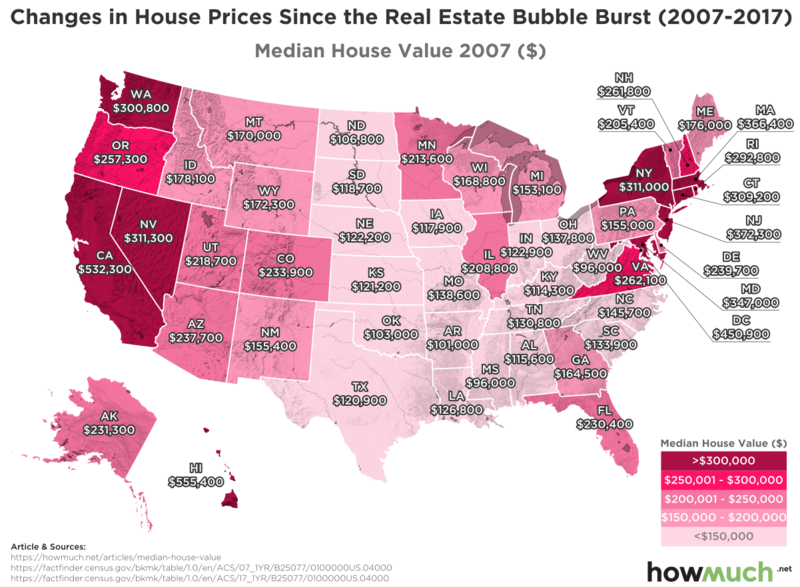 The first image from 2007 shows median home values in a heat map. The second image displays prices as of 2017, plus the percentage change in value from 10 years prior. Housing prices declined almost everywhere across the country in 2008 and 2009. Our GIF therefore highlights the places that have seen prices surge in recent years as well as the states that are still recovering from the crash. Before the housing bubble burst, the most affordable housing market was sandwiched in the middle of the country between the expensive West and East Coasts. Stretching from North Dakota ($106,800) down to Texas ($120,900), housing prices were relatively cheap. California was the most expensive state on the mainland where the typical house cost an eye-popping $532,300. Another cluster of pricey states can be found in the Northeast around New York. The Upper Midwest around the Great Lakes region was somewhere between these two extremes. In total, median house prices are now higher in 41 states plus Washington, DC than they were in 2007. But a closer look at the map reveals how underwhelming housing prices are. 22 states have seen values climb by 20% or less over the course of 10 years. Granted, prices have not only recovered but surged to double-digit increases in a few locations. North Dakota (+82.3%), Colorado (+49.2%) and Texas (+42.4%) have posted massive gains. The boom in domestic shale fracking largely explains the growth in North Dakota. The same can be said about Colorado and Texas, plus the fact that lots of young people are moving to cities like Denver and Austin. But the housing market doesn’t look so positive everywhere, especially in those states that have yet to recover. 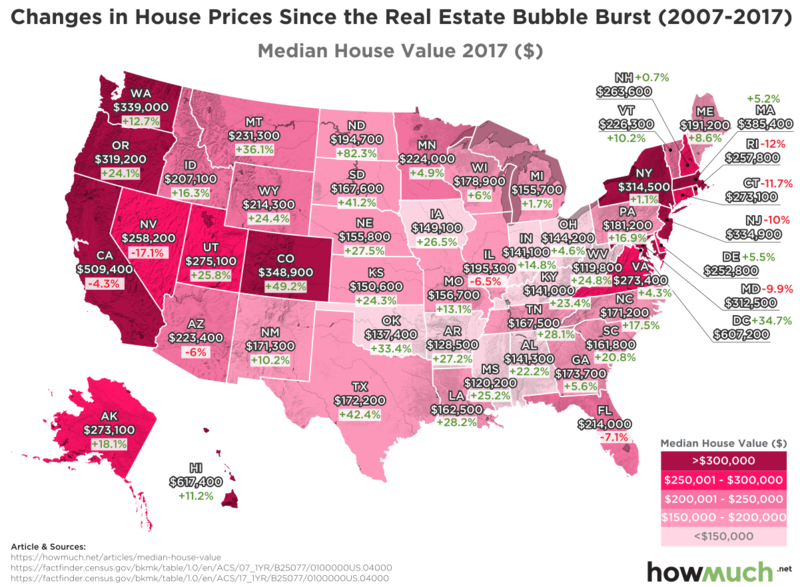 Nevada is a case in point, where median home values are still 17.1% lower than their pre-recession levels. Las Vegas clearly doesn’t hold the same appeal for millennials starting their careers or baby boomer relocating for retirement. Other states like Rhode Island (-12.0%), Connecticut (-11.7%) and New Jersey (-10.0%) similarly remain below their pre-Recession levels. The Great Recession revealed that housing prices don’t always go up year after year. With the Fed raising interest rates and growth starting to slow around the world, what will this same map show in 2027? There’s no telling what the market will look like after a housing correction, much less years into the future.